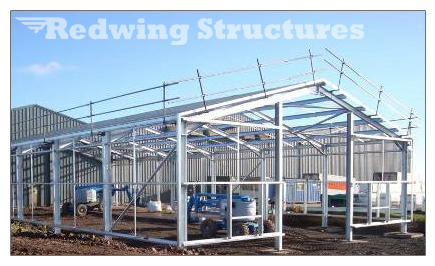 Redwing Marlow offers FREE design advice, based on over 20 years experience in the steel framed building industry. All site staff are skilled holding proficiency certificates for plant operation and steel slinging. Continuous monitoring of sites ensure smooth contract progress, providing clients with quality steel framed buildings, on time and on budget. Free design advice based on over 25 years experience in the industry. Planning Application and Building Regulation Application service at low cost. Buildings that are designed to exceed the British Standards. Careful selection of materials to ensure consistent high quality. Buildings that are designed for minimal maintenance..
Site staff holding proficiency certificates for plant operation & steel slinging. Continuous monitoring of sites to ensure smooth contract.